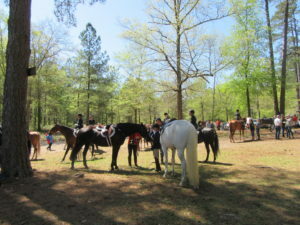 Many equestrian events are held year round in the wonderful setting of Hitchcock Woods. On a recent trip to Aiken, South Carolina I received, as a gift, a book titled “When I think of Aiken” written by Michael Gibbons and illustrated by Betsy Wilson-Mahoney, two long time residents of Aiken who shared in words and drawings their memories of growing up and living much of their lives in this beautiful southern charmer of a city. The book gave me pause to try and remember what I thought of Aiken before visiting for the first time. I realized quite quickly, not much, other than erroneously thinking the city was named for Conrad Aiken the great southern writer for some mysterious reason. It’s actually named for William Aiken a man who never visited the city named after him, but more on that later. I can say that four days later when our first of several visits was over, I knew a lot more. 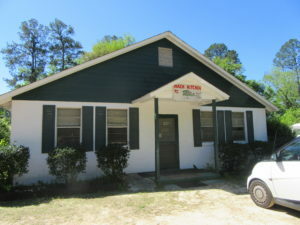 Aiken is a must visit destination for so many wonderful and enlightening reasons. It’s blend of horse country and related annual events, railroad history, superb restaurants, shopping, all aspects of the sporting life, and history. Plus that ever present southern charm and gorgeous seasons. Let’s start with the somewhat intriguing relationship between Aiken and the northeast section of the United States especially New York. In the early 1800’s what is now Aiken was located almost on the border with Georgia along the Savannah River when this sleepy little town was determined to be an ideal place for the terminus of a growing new means of transportation: The Railroad. The South Carolina Canal and Railroad Company (First president the aforementioned William Aiken.) operating between Charleston, South Carolina, and Aiken. This planned city due to its terminus at the end of the railroad line helped popularize Aiken. Further connections later in the eighteenth century made travel from the Northeast more accessible and the wealthy were able to easily transport their horses and staff to Aiken for the winter. The Sunday polo matches VIP section complete with food and libations! Thomas Hitchcock and William H. Whitney were two of the many wealthy New Yorkers belonging to the exclusive equestrian society who longed for a warmer place to spend away from the frigid winters of the Northeast. Thus was born the Aiken Winter Colony and now wealthy New Yorkers (and others) had a place to be warm and bring their beloved horses as they do to this day. The first part of any visit to Aiken should begin with a visit to the old Aiken railroad station which has been restored and converted into the Aiken Visitors Center and Train Museum. Besides getting all the information you might need to further enjoy your visit you can spend an amazing amount of time at the fabulous second-floor museum featuring “in the round” glass encased works of early Aiken in miniature size perfectly proportion exhibits. It’s the finest exhibit in miniature of a city that I have ever seen. Outside there are two Pullman railroad cars that will be restored and you will be able to understand the thrill of watching the trains come in with their wealthy passengers but just as importantly their horses. 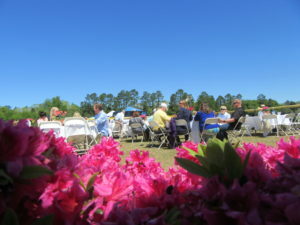 Yes, Aiken is indeed horse country and so much more. Here you can purchase tickets for an excellent 2-hour narrated trolley tour of Aiken (with a stop or two) and it is a great way to get to know the city before you explore on your own. The tour guides are fantastic! There are many great places to stay in and around Aiken from historic to modern, for any budget or even on a golf course! We stayed at the Inn at Houndslake which is just five minutes from downtown. Owner Kim McNeely is a really friendly and well-known business and horse world personality. She graciously told us of the rich history of the hotel from its connection to the golf course to the really cool history of her father’s involvement in the site. The rooms are spacious, freshly renovated, immaculate with great views to the course greenery outside and it’s really quiet. A perfect place to relax after a good day exploring in Aiken. The entire staff at Houndslake was friendly helpful and made us feel better than at home! We experienced the culinary scene in Aiken at multiple eateries and they were all spectacular. The Wilcox also an outstanding Inn is a strong favorite, Rose Hill Estate with its outstanding dining and historic Inn, and Malia’s fabulous kitchen. There are also interesting casual eateries like Betsy’s On The Corner spread everywhere. The Willcox Hotel Is a landmark both as an eatery and hotel. The staff treats you to a relaxing and delicious culinary experience just like the old time wealthy patrons enjoyed and who indeed made it their place of choice for fine dining. Now it has great lunches too and the setting is just grand with the beautiful woodwork throughout the hotel. We make a point to dine here at least once on all our visits to the area. 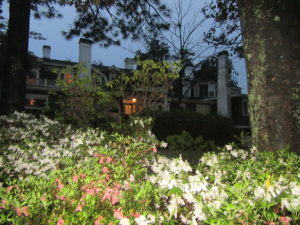 The Historic Rose Hill estate with massive gardens, a beautiful Inn and fine restaurant “The Stables” in Aiken. The Rose Hill Estate features both an Inn and a uniquely set restaurant. “The Stables” is a joy ride of cuisine and just something not to be missed too. The main reasons are the owners Eva Mueller and her son Stephen. There is a wonderful menu and delightful Eva can regale you with her tales of the history of this interesting historic complex. She is usually on hand to greet hotel and dinner guests and her personal background and history are also fascinating Her son, Stephen is truly a southern gentleman and well-versed in the history and people of Aiken. 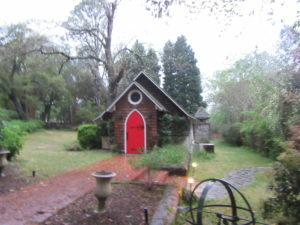 The Wedding Chapel at Rose Hill. Set between the main house and the former stables now a restaurant in a charming garden nook on the side of a hill. Who wouldn’t want their wedding in this magical spot? 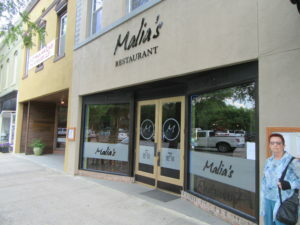 Taste the art of food at Malia’s Restaurant in Aiken. Malia’s on Laurens Street, still makes my mouth water when I think of the meal we had there. Owner/chef Malia Koelker, with Executive chef Michael McFadden, present a truly eclectic menu, so fresh and enjoyable. The well-prepared staff was incredibly knowledgeable and attentive. The dining room with its art, carefully planned seating, lighting, soft music and soothing colors is truly the calm oasis. We cannot wait to go back. Last but not least while you are enjoying the very walkable downtown with a really eclectic assortment of stores and art venues, visit the Aiken Center for the Arts on Laurens Street which is the epicenter of the shopping experience in Aiken. Take time for an old fashioned lunch at Betsy’s On The Corner. Freshly made soups, burgers, hot dogs and specialty sandwiches followed by a homemade dessert is just the pick me up you might want. By the way, if you want a truly different experience for breakfast visit the Track Kitchen by the famous Aiken Horse Training Tracks and eat and enjoy the atmosphere just like the trainers, jockeys and grooms do. A great fun time! Plus now you know how we’ve put these extra ten pounds on! Stop at the Aiken County Historical Museum and explore their treasures! The sporting life, especially with the equestrian events in Hitchcock Woods and at the Whitney Polo Field will take one into the world of horse and rider, the feeling of a gentler and perhaps a more sophisticated society. I had never attended a polo match before and it was a grand festive time especially watching what the spectators do at halftime! (I’m not telling, you have to go!) Events are year round so please check with the visitor’s bureau for dates and updates. Aiken has its own version of an equine “Triple Crown” so check that out also. 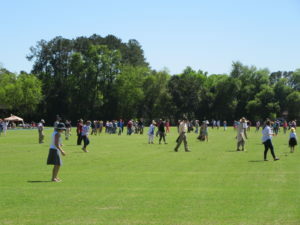 If you love history of all kinds Aiken is filled to the brim. 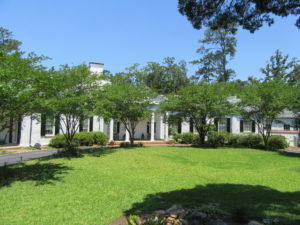 Do not miss visiting the Aiken County Historical Museum, The Aiken Thoroughbred Racing Hall of Fame and Museum as well as the Hopeland Gardens just to name a few. Try to visit the Gaston Livery Stable which is being restored to its 1893 grandeur and features one of the five remaining carriage lifts left in the country. Hopefully, you’ll meet and talk with two of the leaders of the project, Colleen Reed and Elliott Levy, about the plans for the barns use as an arts and culture venue. And you will get great pictures! Stomping the divots at a polo match! Cultural event celebrating Oktoberfest with German-inspired food and beer vendors, an authentic Oompah Band performing on the main stage and local music as well. The 26th Holiday Cup, with 6 steeplechase races around the track. Tailgating, a carriage parade, and the Village of shops round out the event. The Southern City Film Festival (SCFF) will celebrate its 2nd annual film festival from November 2nd-5th 2017. The SCFF is committed to providing an outstanding experience for both our filmmakers and our audiences. SCFF with industry panels, amazing prizes, VIP parties, celebrity guests and so much more is sure to have something for everyone! Last year we screened over 40 films across 5 different venues with parties every night! Join us this year to see southern hospitality epitomized. Aiken Hounds is distinguished as having the oldest drag hunt in the nation. In a drag hunt, cloth saturated with fox scent is dragged across the terrain to create a trail for the hounds to follow. Mounted riders follow the pack. A local clergyman officiates the event each year. The ceremony pays homage to the various traditions of foxhunting, to the heritage of Aiken’s historic hunt culture, and to the skilled hounds that make this sport so engaging. Come downtown to experience luminaries lining the streets of downtown Aiken, as shops stay open late and offer holiday treats, drinks, and music for a festive evening out. The 25th annual Christmas in Hopelands Exhibit features gardens illuminated with over 100,000 lights during this free event. This spectacular walk-through exhibit features over 1.5 miles of lighted pathways and holiday displays along with live music and special events each evening.